The Supreme Court's landmark decision in Citizens United v. FEC reshaped the American political landscape, giving the wealthy more power to influence elections than at any time since Watergate and opening the floodgates for dark money in U.S. elections. 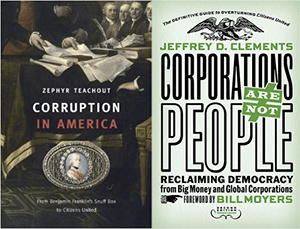 Five years after the Supreme Court decision that set these trends in motion, experts and advocates — including the authors of Corporations Are Not People and Corruption in America — will discuss the state of money in politics today. What are the emerging issues and paths for reform going forward? Please RSVP by filling out the form below or clicking here.